Emotions run high in this true polar adventure. It's a story of triumph, harrowing danger, and outright adventure. In 2012, Aaron Linsdau left his entire life behind.Gone was the engineering career. He told his family and girlfriend that he wanted to pursue a dream to do something no other American had ever accomplished. He wanted to be the first to ski from the coast of Antarctica to the South Pole and back without aid or support. Alone.The journey to the South Pole covers over 700 miles through the most forbidding frozen terrain on the planet. The temperature is always below zero and gale force winds routinely roar across the ice. The polar plateau is devoid of life. There are no plants, animals, or insects. Antarctica provides no shelter, no protection, and is unforgiving of any mistake.But before the expedition was to start, there was much to do. Linsdau trekked 100 miles across the Greenland tundra. He skied across Yellowstone in the winter, camping in -45 degree temperatures. Towing tires up mountains and eating 4000 calories a day was preparation for Antarctica.Previous expeditions have lost tents, helplessly watching them blow over the horizon. Many explorers have quit or been rescued. 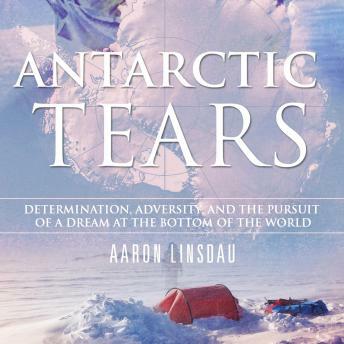 What began as a brave adventure into the unknown turned into a battle for survival.Linsdau takes the reader to Antarctica. They experience incredible storms, skiing blind through whiteouts, crossing invisible crevasses, and skirting disaster. The book shows what happened every day of the expedition.The air is cold enough to freeze water in seconds and cause frostbite in minutes. Only outer space is less hospitable. Driven by passion, he sacrifices nearly everything to make his dream come true.